Living in Italy for the last few months has been surreal, but coming from a Florida beach town I’ve begun to miss the warmth and sun, as the last few weeks in Florence have been filled with rain. My roommate had been toying with the idea of visiting the south of France so I curiously looked up train tickets and was surprised at how affordable they were. We decided then that it was time for a getaway, specifically a French seaside one. We woke up to an absolutely beautiful day in Nice. Our tale begins on a Thursday evening in Nice where we ironically were greeted with rain and gray skies. The following Friday morning though, was possibly one of the most beautiful days I’ve experienced yet during my time here in Europe. 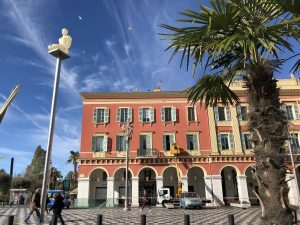 The sky was so blue and the clouds left wispy trails above all of the colorful French Riviera buildings. My pictures turned out looking as if I edited them intensely because of how beautiful the views were. After walking on the famous Promenade des Anglais, we found a great photo spot on the top of a hill. That morning, my roommate and I stumbled across a cute little bakery right by the famous Promenade des Anglais. Our noses were overwhelmed with the fresh smell of croissants and baguettes so we of course stocked up on both, grabbed some coffee, and headed to the beach for a scenic breakfast. 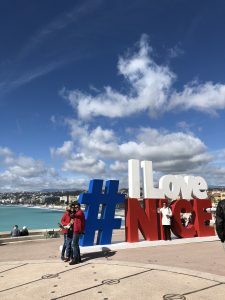 After taking time to savor every bite of our buttery croissants with the stunning view of the cerulean waters, we headed up to a hill overlooking the promenade. The lighting was ideal and the view was surreal, so of course we had to get some pictures taken alongside the small groups of tourists with the same idea. Here’s a cute candid shot of a couple in the flower section of the local market. 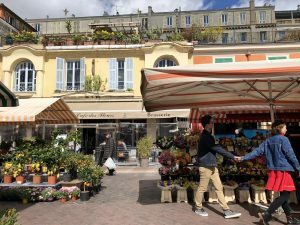 Shortly after walking around the promenade, we ended up at an outdoor market filled with fresh foods, handmade soaps, gorgeous flower arrangements, and locals getting their shopping done. We spent a good amount of time at the soap stands smelling all the different scents with an occasional sneeze or two. We ended our relaxing day with the most delicious dinner that didn’t break the bank completely. Instead of looking up a place to eat, my roommate decided that we should play it by ear and just choose a restaurant that looks the most appealing, and boy did we get lucky when we sat down at Fine Gueule. 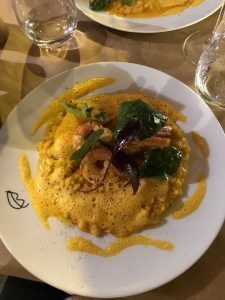 We both ordered the shrimp risotto special that was accompanied with addicting French bread and we ate our meals as slowly as possible to enjoy every morsel. It was a great end to our brief Nice getaway, and certainly not the last. We ended our night with possibly the best shrimp risotto I’ve ever had. Lidia is a spring 2018 SAI Florence student from the University of Central Florida.